A fun and lively live action movie that uses animation to give us a story of humans and “toons” living together, while also presenting us with a cool mystery. Here’s a movie that crosses animation with live action while telling a film noir mystery about murder and deceipt. It’s an odd combination, because the genre is naturally very dark and seedy and hardly the kind of place you’d expect to find cartoons. And yet somehow it works. That’s in large part because of Bob Hoskins, playing the hero tough guy detective, and playing it straight, despite having a partner who is a giant animated rabbit. The mystery of chasing down clues and uncovering the truth really works. The movie does get a little too silly in it’s final segment, but otherwise this is a pretty great film. Who Framed Roger Rabbit is a pretty entertaining mystery that combines live action with animation in a format that was groundbreaking for its time. This is the first time in history that anything like this was done before. Four years later, Cool World tried to do the same thing, (without the same level of smart writing,) and didn’t have nearly as much success. But Roger Rabbit was the one, and that’s because it’s a well-crafted movie. Even without the animation, this film would work as a live action mystery film. It’s got the tone and atmosphere and even the characters to make any movie good. Now, throw in the animation and story about toons and a fictional place called Toon Town (which gets more than a few references to the Jack Nicholson film, Chinatown,) and you have the recipe for a pretty cool film. 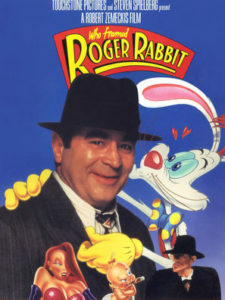 Bob Hoskins plays the protagonist, Eddie Valiant. He’s a tough guy, no-nonsense detective and just casting this actor in this role is the movies first smart move. Hoskins is the perfect tough guy. He rose to fame with The Long Good Friday, the British gangster film made at the start of the eighties. Now, eight years later, he’s kind of spoofing himself here, but doing it by playing it straight and letting the jokes land where they may. It works. What also works is that the protagonist is not an animated character, but a live action character, played by a real actor who we can relate to. The animation is background or secondary, which makes it a nice addition to what’s already going on. This first becomes apparent when Eddie leaves the office of the man who is hiring him to take a case, and sees animation creatures all around him. RK Maroon is the head of an animation studio, and Roger Rabbit is his biggest star. There are rumors that Roger’s wife, Jessica Rabbit, is cheating on him, and the rumors are getting to Roger and making him unhappy. Maroon hires Valiant to find out the truth. And on his walk down the stairs of Maroon’s office, on the studio lot, there are tons of animated characters walking by, each dealing with his or her own issue. Even before this, however, the blend of animation and reality is thrown right at us, starting with the very opening scenes. First we are with Roger Rabbit and a baby in an animated film, which seems like the kind of animated short that Disney often throws in front of their movies, to warm the audience up. Only this one is actually part of the movie. We watch the animated film, and then here a bell ring and a director yell cut. Suddenly the animated characters start acting differently, (especially the demanding, tough talking baby,) and walk off the set into the real world. This is where animation literally meets live action, and it’s a great way to start the film. Not long after that, we meet Valiant and learn about the case. Valiant is a drunk, down and out detective. Hardly your typical protagonist in a movie for kids. Only Who Framed Roger Rabbit isn’t just a movie for kids, and that’s in large part what makes it great. This is a movie that features kid characters, (animated “toons,”) but combines them with a pretty dark story. Valiant gets those pictures of Jessica Rabbit doing something with this other man, Marvin Acme, and what they are doing is playing “patty cake.” Apparently that means something to Roger who freaks out, but not enough to leave his wife. Valiant’s job is done, and the mission seems complete until something happens that changes everything. Acme is found dead in his office. Considering that he was the guy in the photos that Roger just saw, and the way that Roger stormed out after seeing them (literally running through the wall, leaving a Roger shaped hole in the wall behind him,) it seems like Roger is the character who would have the motivation ton kill Acme. Valiant starts investigating and finds that this whole thing is juicier than he even thought. First off, the baby actor, (Roger’s costar,) tells Valiant about a will of Acme’s which has gone missing. The will was supposed to give ownership of Toon Town back to the Toons. The baby thinks that the missing will is the key. Valiant also meets a guy named Judge Doom (played by a pretty scary Christopher Lloyd,) who dresses all in black and looks like a sadistic psycho. This guy looks like the head Nazi in Raiders of the Lost Ark, who sets Marion’s bar on fire. He has invented a material called “dip” which is basically a barrel of acid that the characters lower toons into. And the toons melt in the acid until they meet their death. This is all demonstrated to us when Judge Doom takes a red and white shoe and melts it down. And now, Doom is after Roger. Valiant decides he needs to get to Roger first and set the record straight. 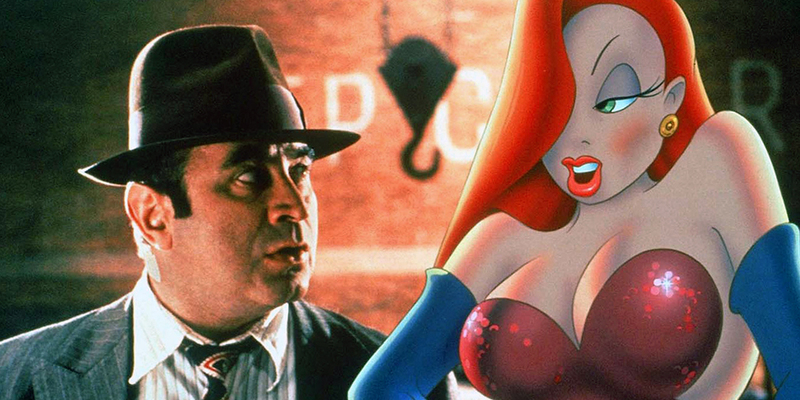 But first he speaks with Jessica Rabbit, who has some secrets to share with him, of her own. Jessica tells Valiant that Maroon forced her to play patty cake with Acme. He set the scene up and then hired Valiant to take pictures of it. The reason for all of this was so that he could blackmail Acme. Now it seems that Acme’s properties have gone to Maroon, and Maroon is selling them all to a mysterious company called Cloverleaf that is buying up the entire town. Valiant goes to see Maroon to confront the man about all this, and that’s when Maroon is murdered. Now it’s just Valiant and Roger, trying to find the killer. All of this is fantastic. The mystery angle, and different characters, motivations, and reveals are all cleverly structured. So are the scenes where Judge Doom and his weasels (his animated henchmen,) storm into places looking for Roger. They come into the bar, where Roger is hiding behind a wall, and Doom taps on a wall in a certain way (the the rhythm of “Shake and a haircut, two bits.”) Roger can’t resist the song. And there’s also a scene where the Weasels storm into Valiant’s office and he has to hide Roger in the sink. That’s two scenes of him hiding Roger from the enemies, and two different tycoon characters who were involved in scandalous dealings and wind up dead. At a certain point this starts to feel a little repetitive. And then the film moves into it’s final act, and it’s for the worse. For the first time, the villain who has been so scary and menacing, starts to seem a little cartoonish (pun intended.) And the mystery kind of comes to an unsatisfying resolution. But at least it takes us into Toon Town, which we’ve been hearing about throughout the film, and finally get to go to, for the climax, (again, just like Chinatown.) While the movie wears out its welcome towards the end, there was so much great about the movie, that it’s hardly detrimental to what came before. Valiant’s storyline about how a toon killed his brother, and has made him resentful of toons, while also turning him into an alcoholic, is great. So is the mystery he pursues, and the dynamic between he and Roger. The comedy between them is pure slapstick, and it really works. Robert Zemeckis directed this creative gem, and this is one more notch on the director’s belt which shows why he’s one of the most innovative directors of all time, (other notches for him include Back to the Future, Forest Gump, and The Polar Express.) With Who Framed Roger Rabbit, he pushes the envelope of where animation can go and does it by combining these characters with live action dark noir storytelling. The formula definitely works.